All week it has felt like fall here. So much so that I pulled my jeans out this morning (don’t worry, I’m still wearing my flops! Not ready to give them up yet.) A little snug, but it’s too cold to wear capris. I’m sure I will regret this later. The cool weather will be leaving us soon. It is supposed to get hot again next week and then cool off. This is not the best weather for my allergies! But I am so ready for it to be fall. I am ready for the school year to start and things to settle down at work (yeah right). I am ready for the crisp fall air. I am ready to pick pumpkins and apples and decide what E should be for Halloween. I am ready. 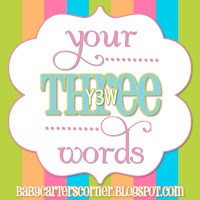 You can find more information on your three words, HERE!